Booklet of First Call Proposal Writings Abstracts..
Concept paper submission opens: July 5th, 2014. Concept paper submission deadline: August 15th, 2014. Final decision announcement: September 15th, 2014. Revised concept paper submission deadline: September 22nd, 2014. Contracts signing: September 27th to 30th, 2014. Concept paper submission opens: January 1st, 2014 – 2pm. Concept paper submission deadline: February 1st, 2014 – 2pm. Extended to February 15th, 2014 – 2pm. Final decision announcement: March 1st, 2014. Moved to March 15th, 2014. Revised concept paper submission deadline: March 8th, 2014. Moved to March 22nd, 2014. Contracts signing: March 15th to 22nd, 2014. Moved to March 25th to March 29th, 2014. 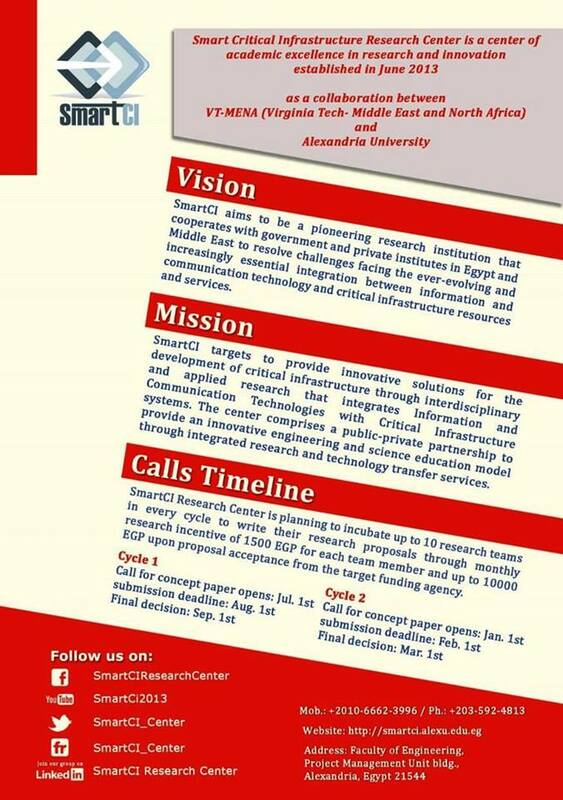 SmartCI Research Center is planning to incubate up to 15 research teams in every cycle to write their research proposals through monthly research incentive of 1500 EGP for each team member and up to 10000 EGP upon proposal acceptance from the target funding agency. Details, guidelines and the overall process of the call are clarified in the SmartCI Call for Concept Paper. Applicants must use the following proposed Concept Paper Template. Applicants may use List of Funding Opportunities and List of Funding Agencies. Concept paper submission by e-mail to: sci@mena.vt.edu. Applicants should use the Concept Paper Template. Frequently asked questions will be posted on FAQ. Concept paper Submission opens: July 1, 2013 – 2pm. Concept paper Submission deadline: August 1, 2013 – 2pm. Concept paper Submission Deadline has been extended to: August 15, 2013 – 2pm. Final decision announcement: September 1, 2013. Final Decision has been moved to: September 15, 2013.